The much-awaited Ranveer Singh- Deepika Padukone wedding is finally confirmed to happen on November 14th and 15th this year. The actress herself announced the date in an interview as well as posted a picture of a printed card on Instagram. 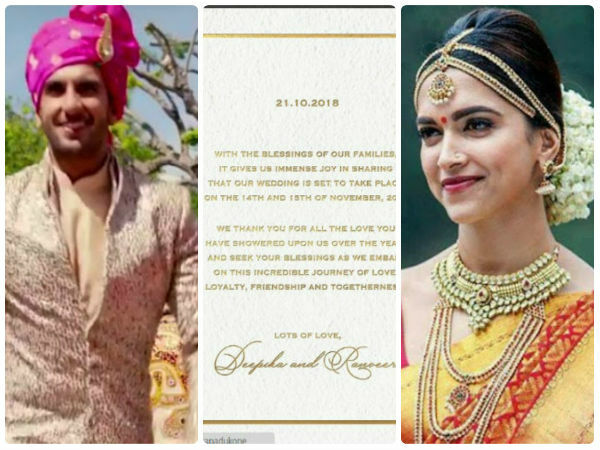 In the card, apart from declaring the date of the wedding, Deepika and Ranveer also thanked her fans for all the love they have showered on the couple over the years and sought blessings for the couple’s incredible journey of love, loyalty, friendship and togetherness that is to come. In an interview with a leading media house, Deepika confessed being excited about her marriage just like she would be excited while signing a new film. She added that she has often looked forward to her wedding just like any other girl. The Padmaavat actress who is the daughter of ace badminton player Prakash Padukone and Ujjala Padukone said that the way her parents lead their life together making their marriage a successful one is exactly how she intends her married life to be. She also went on to say that her life wouldn’t change much after the wedding. Although they had met before, Ranveer Singh and Deepika started dating during the filming of the blockbuster movie Goliyon ki Raasleela Ram-Leela. After dating each other for over six years, the couple is now tying the knot at Italy’s Villa del Balbianello in Lake Como. This breathtaking destination is famous among Hollywood filmmakers. For one the venue had hosted the Star Wars Episode II Attack of the clones and the Casino Royal. The Hollywood’s popular stars George Clooney, Madonna and Richard Branson also own properties here. The sangeet is rumored to take place on November 13, 2018 followed by which two separate wedding ceremonies are to be held on November 14 and 15 respectively. The wedding will be attending only by the couple’s family and close friends. Later this happening pair is to host two grand receptions. One is set to happen on November 21, 2018, at The Leela Palace, Bengaluru where Deepika grew up. The second is held on December 1, 2018, in Mumbai for the couple’s friends from the film industry. There are way too many speculations on what designer or designers the couple have hired to design their wedding outfits. Deepika immensely adore sarees and Lehengas created by the designer Sabyasachi. She had even confessed once in a chat show that Sabyasachi’s creations would be her preferred designer for her wedding outfits. There are rumors that Deepika might have finally zeroed down on this designer. To add excitement to the flying rumors, the designer Sabyasachi recently shared a picture on Instagram from one of his recent collaboration with Deepika and Asian Paints for a special edition of wallpapers. There are no confirmed reports on the guest list as well. Apart from family and few close friends to the list, the names of Arjun Kapoor, Sanjay Leela Bhansali and Karan Johar are making rounds. The news about this adorable couple tying knot has made their fans across India and the world very excited. We can’t wait to see their lovely wedding happen. We wish both Deepika and Ranveer all the good fortune for their life ahead!!! !